Sathiguru Arjun Dev Jee Maharaj begins the shabad in ghar 2, in the second house of beat and rhythm. There is One eternal, all creative being Who is found through the prasaadh, the grace and the mercy of The Sathiguru, The True Guru. Sathiguru Paatshah Jee begins the shabad by telling us the feelings of a young soul bride who is talking to an elder sister, an elder sibling and is presenting before her the pain of the separation from her beloved Husband Lord. It is as if on a spiritual level, a seeker of the path is speaking to a holy saint and asking that saint, asking that gursikh, asking that piaaraa, asking that beloved holy soul the path to union with God. Within me, inside a(n)thar, there is a lochaa, there is this constant longing of milan kee, of union with my beloved, with my piaarae. Ho kio paaee gur poorae. Ho - in what way, can I paaee - obtain. In what way can I obtain, can I attain, can I become one with my gur poorae? Poorae, my perfect Guru. What is the path of being united with The Guru? It doesn't matter how many khael khaelaaeeai, how many games and toys the baalak, the child has to play with, even if that child has so, meaning hundreds of games, rehi n sakai bin kheerae. But without kheerae, without milk that child cannot rehi, cannot survive. Sathiguru Sachhe Paatshah jee is saying that the milk of The Naam, of God's Name is our soul's sustenance. Our worldly attachments and our worldly possessions are merely toys. It doesn't matter how many of these toys you get together, the essence of life is the milk of Naam, is that immortal nectar of Naam. Without that, all of these toys are worthless. But with The Naam, we can still be part of the world, enjoy these toys, but remain unattached. A(n)maalee is talking to an older sister type of figure, in other words, someone who has been there, who's been through the process, who's united, a holy soul, a holy saint. Sathiguru Sachhe Paatshah Jee is saying O my elder sister, O gurmukh piaaraa, O one who follows The Guru completely, the bhukh - the hunger, which is a(n)thar - inside me, n outharai - cannot be removed, jae so bhojan mai neerae. Neerae means to be served. If I am neerae, if I am served, so - hundreds, of bhojan - different types of food, even then my hunger is not removed. It's not longing for this food, it's longing for that spiritual sustenance. It's like if you were to ask that gurmukh piaaraa who is in vairaag, who is in longing for That lord, that why don't you eat this, who don't you do this, they answer that's not what I'm hungry for. The true hunger Guru Jee tells us in this line. Maerai man than, my mind and body are filled with praem - love, for my pira(n)m, for my beloved Lord. How can I dhheerae? How can my man - mind, dhheerae - survive without dharasan, without the beloved vision of Waheguru? Sun sajan, O listen my friend. Maerae preetham bhaaee, O my preetham - my beloved, bhaaee - my soul brother, O gurmukh piaareyo, O holy saints, mai maelihu sukhadhaathaa. Maelihu - unite me with my mithra, my true friend sukhadhaathaa, The one Who is The giver of all peace, Waheguru. He knows, jaanai means to know, He knows the baedhan, the plight of my jeea, of my soul, He knows the plight of my soul, He knows my inner cries that no-one can hear. The cries that cannot even be expressed through external tears, the cries which my soul cries every day, only He knows that. Nith sunaavai har keeaa baathaa. 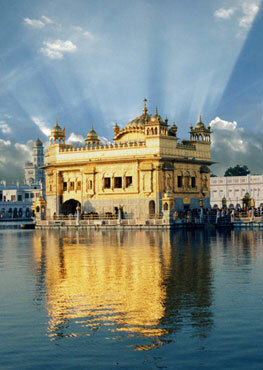 He tells me baathaa, the path and stories of Hari, of Waheguru, He tells me the path to Waheguru. Even eik khin, even one second I cannot live without Him, jio chaathrik jal ko bilalaathaa. Like chaatrik, like the cuckoo hawk cries out and says peeo peeo, jal ko bilalaathaa, as it cries out for water, in the same way I cry out for my beloved Guru. This relates back to when Guru Arjun Dev Jee Sahib were separated from Guru Ram Das jee, when Guru Arjun Dev Jee had to go to Lahore for a family wedding, and they were crying out for Guru Ram Das Jee's darshan. In that state of longing, they wrote the Shabad Hazaare which Singhs recite in their nitnem everyday. What gun, what virtues are there, there are so many virtues, how many can I samaalee. How many can I sing about? How many can I saar, do I have knowledge about? Mai niragun ko rakh laethaa. Your greatest virtue is that You rakh laethaa, You save even the niragun person like me who has no virtues. O holy friends, I have become ouddeenee, I have become sad waiting, longing for my ka(n)th, my husband Lord. So pir kadh nainee dhaekhaa. When will I dhaekhaa, when will I see with my nainee, with my eyes of love and dedication, that pir, my Husband Lord. I've visarae, I've forgotten all of the ras, all of the pleasures of this world. Bin pir, without my pir, without my Husband Lord, none of these accounts for anything. This than - body, which is like a kaaparr - cloth, which has been given to me, even this n sukhaavee, even this I've given up on. Kar n sako ho vaesaa. There are no more ways I can vaesaa, I can dress myself. I've lost the desire to dress myself in various ways, to put on various garbs and guises for the world. Those people who have raaviaa, who have enjoyed my laal, my beloved Waheguru, thin aagai ham aadhaesaa. In front of them, I bow down, I do aadhaes again and again. O my beloved sister, My beloved holy saints, I adorned myself and done every seegaar, every decoration, but bin pir kaam n aaeae. Without my pir, without my husband, none of these account for anything. If my sehi, my Husband Lord, baath n pushheeaa, does not ask about me, takes no interest, there is no union with Him, thaa birathhaa joban sabh jaaeae. Then my joban, my youth will go birathhaa, will be wasted. Blessed are those sohaaganee, those happy soul brides, a(n)maalee, O sister, jin sahu rehiaa samaaeae, within whom my Husband Lord abides. Samaaeae means to abide with, rehiaa means within. Rehiaa samaaeae means to abide within. O sister, I am vaariaa, I am a sacrifice to those sohaaganee, to those happy soul brides, thin kae dhhovaa sadh paaeae. Sadh, I will forever and ever, dhovaa - wash, their paaeae - their feet. Jichar - as long as, dhooja bharam saa a(n)maalee, I have that doubt of duality in my mind; thichar mai jaaniaa prabh dhoorae, it was only in that time that I thought, I jaaniaa, that my prabh, my Waheguru was far away, was dhoorae. But O sister, when I miliaa, when I met my pooraa sathiguroo, my true perfect Guru, thaa aasaa manasaa sabh poorae, then the aasaa - the hopes, and the manasaa - the thoughts of my mind, were all poorae, were all fulfilled. I have found sarab sukhaa, all peace, the highest peace, the highest of all happiness, pir sarab rehiaa bharapoorae, when I realised that my Waheguru was bharapoorae, was pervading through all and everywhere. O sister, I have maaniaa, I have enjoyed that har ra(n)g, that colour of God's Name, the colour of God's Name. Gur sathigur kai lag pairae, by lag - by attaching myself, to the pairae - the feet, of my True Guru. So what Guru Arjun Dev Jee Maharaj here is explaining is that longing, and what to do in that longing. In that longing, sit with the holy ones, ask them the path, bow down to them, learn from them, ask them the way Sathiguru Paatshah Jee is saying to us today. Take the advice and you will be united with your Lord and Master. Waheguru Jee Ka Khalsa, Waheguru Jee Ki Fateh.